THE FOLLOWING are court results for Chichester and Worthing magistrates’ courts from September 21 to 25. Andrew Campbell, 20, of Scotney Close, Worthing, must pay £900 compensation, £180 criminal courts charge, after his dog, a German shepherd / Japanese akildo cross, caused injury while dangerously out of control in his garden on May 9, 2015. It was ordered that the dog be destroyed. Aleksandras Lukasevicius, 32, of London Road, Littlehampton, was given a community order and must carry out 180 hours’ unpaid work, after being found guilty of using violence to secure entry to premises in Worthing on January 11, 2015. He was also given a restraining order and must pay £200 compensation, £60 victim surcharge and £620 costs. He also admitted theft by finding of a garden strimmer, no separate penalty. Hayley Godber, 37, of Orchard Way, Barnham, was fined £75 and must pay £20 victim surcharge, £85 costs, after admitting driving without due care and attention in Main Road, Yapton, on January 18, 2015. Her driving record was endorsed with three points. Samuel Heard, 26, of Kingsway, George V Avenue, West Worthing, was fined £300 and must pay £55 compensation after admitting stealing clothing from Beales, Worthing, on September 6, 2015. He was fined £300 and must pay £80 compensation, £35 victim surcharge, £85 costs, £150 criminal courts charge, after admitting stealing clothing from Beales, Worthing, on September 2, 2015. He admitted breaching a conditional discharge and was dealt with for the original offence. He was fined £350 for stealing Soap and Glory boxsets worth £31 from Boots, Goring, on November 18, 2014. Ian White, 54, of Southfield Road, Broadwater, was fined £350 after admitting driving without insurance in Broadwater Street West, Worthing, on May 22, 2015. He was also fined £200 and must pay £35 victim surcharge, £85 costs, £150 criminal courts charge, after admitting driving without due care and attention in Broadwater Street West, Worthing, on May 22, 2015. His driving record was endorsed with six points. James Armstrong, 26, of Fullers Walk, Wick, was fined £275 and must pay £28 victim surcharge, £85 costs, after admitting drug driving (57ug benzoylecgonine) in Lyminster Road, Littlehampton, on June 28, 2015. He was disqualified from driving for 12 months. He also admitted drug driving (3.5ug Delta-9-THC), no separate penalty. He admitting breaching a suspended sentence and was fined £25 for the original offences of harassment. Craig Garland, 31, of New Road, Durrington, was given a community order and must carry out 120 hours’ unpaid work after admitting driving in New Road, Worthing, on September 7, 2015, while disqualified. He must pay £60 victim surcharge, £150 criminal courts charge, and his driving record was endorsed with six points. He was also fined £425 and must pay £85 costs after admitting driving without insurance. Ian Heard, 30, of Spring Court, Howard Street, Worthing, was given a community order with 14-day curfew between 8pm and 8am, electronically monitored, after admitting stealing meat worth £108 from Co-op, Ham Road, Worthing, on August 17, 2015; stealing detergent worth £55 from Co-op, Salvington Road, Worthing, on August 17, 2015; and stealing room fresheners worth £130 from Co-op, High Street, Shoreham, on August 18, 2015. He must pay a total of £238 compensation, £60 victim surcharge, £85 costs and £180 criminal courts charge. Curtis Shergold, 22, of Beaconsfield Road, Wick, was fined £155 and must pay £358 compensation, £20 victim surcharge, £85 costs, after he admitted his dog caused injury while dangerously out of control on June 7, 2015. The dog will be destroyed unless it is muzzled at all times in public and a barrier put in place to prevent it running out of the front door. Neil Woods, 42, of Warren Court, Sompting Road, Lancing, was jailed for eight weeks after admitting stealing a £44.99 joystick from Game, Worthing, on September 6, 2015. He must pay £80 victim surcharge and £150 criminal courts charge. Adedoyin Kiladejo, 21, of Watling Court, Butts Road, Southwick, was given a community order and must pay £60 victim surcharge, £85 costs, £150 criminal courts charge, after admitting possessing 13 counterfeit £50 notes in Homefield Road, Worthing, on April 18, 2015, and possessing cannabis in Homefield Park, Worthing, on April 18, 2015. David Spiers, 52, of Esmonde Close, Littlehampton, was discharged conditionally for 12 months and must pay £15 victim surcharge, £85 costs, £150 criminal courts charge, after admitting using threatening words or behaviour at Chichester Railway Station on June 20, 2015. Jonathan Trew, 37, of Wallace Avenue, West Worthing, was discharged conditionally for 12 months and must pay £15 victim surcharge, £85 costs, after admitting possessing heroin on March 23, 2015. Charmaine Jillett, 35, of Springfield Gardens, Salvington, was fined £60 and must pay £20 victim surcharge after admitting driving over the 60mph speed limit on the A24 West Grinstead on March 12, 2015. Her driving record was endorsed with three points. Clive Jones, 56, of The Quadrant, Goring, was fined £135 and must pay £20 victim surcharge, £85 costs, after admitting driving without wearing a seatbelt in The Boulevard, Worthing, on April 8, 2015. Vladimir Maca, 34, of Mile Oak Road, Southwick, was fined £660 after being found guilty of failing to identify a driver when required by police in Shoreham on February 4, 2015. His driving record was endorsed with six points. He was fined a further £660 and must pay £66 victim surcharge, £85 costs, after being found guilty of failing to identify a driver when required by police in Shoreham on February 4, 2015. He was disqualified from driving for six months due to repeat offending. Joshua Ross, 25, of Marigolds Lodge, Holms Lane, Rustington, was fined £520 and must pay £52 victim surcharge, £85 costs, after admitting driving without insurance in Tideway, Rustington, on November 17, 2014. His driving record was endorsed with six points. Simon Cossins, 29, of Warnham Close, Goring, was fined £660 and must pay £66 victim surcharge, £85 costs, £150 criminal courts charge, after being found guilty of failing to identify a driver when required by police in Shoreham on July 2, 2015. His driving record was endorsed with six points. Shaun Peckham, 47, of Anscombe Close, Worthing, was fined £220 and must pay £22 victim surcharge, £85 costs, after being found guilty of using a hand-held mobile phone while driving on the A259 Lancing on April 11, 2015. His driving record was endorsed with three points. Andrew Gedling, 49, of Downland Park, The Street, Bramber, was fined £645 and must pay £65 victim surcharge, £85 costs, after being found guilty of driving without insurance in Arundel Road, Worthing, on January 7, 2015. He was disqualified from driving for six months due to repeat offending. George Kasparis, 57, of Poulters Lane, Worthing, was fined £645 and must pay £65 victim surcharge, £85 costs, after being found guilty of failing to identify a driver when required by police in Shoreham on March 23, 2015. He was disqualified from driving for six months due to repeat offending. Jason Power, 27, of Terringes Avenue, Tarring, was fined £300 after being found guilty of failing to identify a driver when required by police in Shoreham on February 19, 2015. He was also fined £345 and must pay £35 victim surcharge, £85 costs, after being found guilty of failing to identify a driver when required by police in Shoreham on February 25, 2015. He was disqualified from driving for six months due to repeat offending. Lynette St Quintin, 49, of Canada Road, Arundel, was fined £1,200 and must pay £120 victim surcharge, £85 costs, after admitting failing to identify a driver when required by police in Shoreham on November 7, 2014. Her driving record was endorsed with six points. Andrew Cairns, 49, of Arundel Road, Littlehampton, was fined £660 and must pay £66 victim surcharge, £85 costs, £150 criminal courts charge, after being found guilty of driving without insurance in Lyminster Road, Lyminster, on May 7, 2015. His driving record was endorsed with six points. Campbell Mulloy, 24, of Alberta Walk, Durrington, was fined £100 and must pay £20 victim surcharge, £85 costs, after admitting driving without wearing a seatbelt in Salvington Lane, Worthing, on March 12, 2015. Alison Sheen, 40, of Old Shoreham Road, Southwick, was fined £660 and must pay £66 victim surcharge, £85 costs, £150 criminal courts charge, after being found guilty of failing to identify a driver when required by police in Shoreham on June 13, 2015. Her driving record was endorsed with six points. 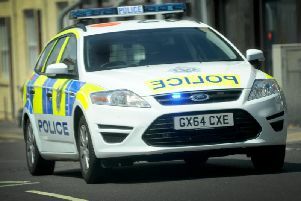 Renee Taylor, 33, of Elspring Mead, Wick, was fined £660 and must pay £66 victim surcharge, £85 costs, £150 criminal courts charge, after being found guilty of driving without insurance in Clun Road, Littlehampton, on May 1, 2015. His driving record was endorsed with six points. Lee Chapman, 34, of Ash Court, Prince Charles Close, Southwick, was fined £215 and must pay £22 victim surcharge, £85 costs, £150 criminal courts charge, after being found guilty of using a hand-held mobile phone while driving in Old Shoreham Road, Hove, on April 27, 2015. Her driving record was endorsed with three points. Martin Rome, 50, of Bridge Road, Broadwater, was fined £100 and must pay £20 victim surcharge, £85 costs, after being found guilty of driving a vehicle without an MOT certificate on the A24 Findon on March 14, 2015. Darren Taylor, 40, of Worthing Road, Rustington, was fined £645 and must pay £65 victim surcharge, £85 costs, £150 criminal courts charge, after being found guilty of driving without insurance on the A259 Bognor Regis on April 17, 2015. His driving record was endorsed with six points. Alex Derekis, 28, of East Bank, North End Road, Yapton, was fined £120 and must pay £20 victim surcharge, £85 costs, £150 criminal courts charge, after admitting drink-driving (79mg of alcohol in 100ml of breath) in South Street, Chichester, on September 4, 2015. He was disqualified from driving for 17 months.